If you're going to treat eBay like a garage sale, don't be surprised if you receive garage sale prices. Your eBay Store is a front-window display for your valuable business. In a previous article about eBay Store designs we shared how important the look of your business is to your bottom line. But it's not just the design that's valuable for your customers. They don't know you, and can't hear or see you. The only determination they have of your business is what's on that Web page. What does your front window say to your potential buyers? Some sellers fill the valuable header area with rants about eBay, government policies and feelings about customers who leave bad ratings. Others use half of the front page to announce every promotion and deal they're running before the customer can even see the merchandise. 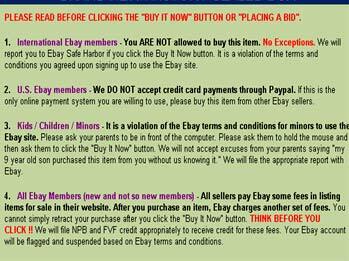 Still others don't even bother to update the eBay placeholder information. Remember: Think like a buyer, not like a seller. Be nice! Your description and policies are like your sales person who has just met your buyer in your store. What are they saying to your buyer? I don't buy anything from sellers who threaten me with: "Must pay in 72 hours" or "Don't bid unless you intend to buy." Talk to the 99 percent of your customers who are amazing buyers. Don't belittle the people who want to give you money by focusing your descriptions on previous bad experiences. All you will do is attract more bad buyers with a vocabulary that they understand. A good description includes features and benefits of the item you're selling—features are facts and benefits are bonuses. A fact of your item might be that it's a navy raincoat, size XL. The benefits may be that it won't show dirt, will keep you dry during those rainy football games and that it's roomy enough to layer with other clothing. Always check your grammar and spelling. Buyers subconsciously believe that if you're careless with how your business is presented that you'll treat their purchase (and subsequent shipping) the same way. A good rule of thumb is to write a description of your item as though you don't have a photo. As a buyer, I have my choice of multiple listings from multiple sellers. The items are relatively similar in price and quality. 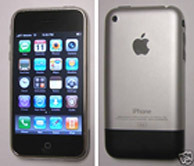 However, based on the pictures of iPhones below, which one would you buy? Turn off your flash. Use natural lighting (like close to a window) or purchase professional light stands. Use a plain background. There's a reason that the "floating image" is so coveted. A blank piece of poster board or some white fabric from the remnants bin will increase the professional look of your photos instantly. Crop in as closely as you can. The buyer only needs (and wants) to see the item they are actually purchasing. Not your knee, hand or couch. Invest in a tripod. Hey, for $25 you won't have to hold your item anymore or have images that appear to be in motion. Find your Macro setting. This is your friend for close-in photos, details and smaller items such as jewelry. If the item has a defect or flaw, include a photo of this. Your buyer's security and confidence will increase with this extra image, which shows you to be upfront and honest about the item. This one is huge. We live in an instant gratification society—egad, our attention spans have now been reduced to "tweeting" 140 characters of thoughts. The Buy It Now sales on eBay increase dramatically each quarter on eBay's financials. 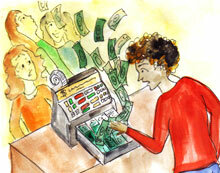 Your customers pay with PayPal because of the quickness of the transaction. And they expect their packages in the mail moments after they've paid. But if you're in business to create a profit, you need to realize and embrace your buyers' expectations of fast action. If they don't get it from you, they'll spend their money with a seller who can provide those benefits. How quickly you handle e-mail communications will play a large part in whether you acquire the customer. You can create up to 15 FAQs for your viewers to read before they get to the box to ask you a question. Since I created my FAQs, my volume of e-mail questions has gone down by 85 percent—no joke. When you do receive an e-mail from a customer, answer it as quickly as you can. I realize not all of us are glued to our computers, but if you're running an online business, it's your responsibility to be online in a timely fashion. Someone just lost a $100 sale from me. During the two days it took them to get back to me I had found another supplier. "I'm not tellin you nothin. You type of people just askme(sic) all sorts of questions and take up my time and never bid. Go find someone else to bother." I'm guessing this person probably isn't making any money on eBay. Use a new box. Order the free ones from the U.S. Postal Service and UPS. For earth-conscience people out there, recycle your used boxes locally; don't use them in your professional business. A company like Uline has numerous sizes of boxes for your business, including a recycled line. Create a professional label. I can't believe how many packages I still receive with a handwritten label slapped on with a couple pieces of tape. If you're running a professional business, invest in your success by printing your labels online. I use Endicia because I can include my branding on the label as well as a graphic about the five-star customer service we offer. Packaging is a given and by now shouldn't even be an issue—yet I still receive things wrapped in newspaper. Quit that! What experience do you give them when they open the box? Besides the item they've been excited about receiving, do you include a thank you note? A small freebie such as a pen, magnet or calendar? Have you provided them a clear way to purchase from you again? Have you invited them to sign up for your newsletter so you can stay in contact with them? Did you enclose a coupon? This shouldn't be a one-time customer. You worked hard enough to get them the first time—make it easy for them to be a repeat customer. Focus your attention on these five powerful customer service areas and your DSRs will increase. With higher DSRs, you'll see your eBay PowerSeller rebates grow larger and you will attract more buyers, rather than have them click over to your competitor. quote: Originally by mushroomcathy: Has anyone figured out how to change the size of the USPS printed label to a smaller label? Me too! I once received a package with a smaller label. I meant to ask the seller how this was done, but forgot, and now I don't remember who the seller was. Good Question! Has anyone figured out how to change the size of the USPS printed label to a smaller label? Me again, I disagree with including free gifts with a purchase. When I get a free gift it's usually something I don't need & now I got to get rid of that too. Not that I don't already have a house full of junk already. Plus, ask me who sent me the free gifts I've gotten or the thank you note they included & I wouldn't be able to tell you who they were. Sellers, please keep your free gifts! It's a waste of time & money. Learn what eBay's algorithm uses to return search results. Hiding your true locality is a turnoff for buyers. Bad product photos and offensive policy statements scare away buyers. Invest in customer satisfaction to improve your DSR returns.